While the Sperrys may not live in Moraga, and live in unincorporated county land that borders Moraga, the small town is in their DNA; they breath Moraga, and almost every day of their lives they have given something of their time and skills to the East Bay suburb. They will be honored for their multiple contributions over several decades during a dinner starting at 6:30 p.m. Saturday, April 28 at the Saint Mary's College Soda Center. Susan Sperry's father bought the 80 acres of undeveloped land where the family still lives the year she was born, before there even was a town of Moraga. In fact, Sperry says that when they moved into their ranch a few years later, her mother would mostly be involved with Lafayette that already existed as an unincorporated village. It was a time when the train would run from Oakland through Canyon, past the college and would stop not too far from Lafayette's Town Hall where the community met. Years later, Susan Sperry started her teaching career in the recently formed Moraga School District. Next year, Sperry will have continuously contributed to that district for a record of 50 years. Sperry taught, of course, and that was her job, but she also started the historical tour of Moraga for her middle school students, and now for third-graders. This annual program is an emanation of the Moraga Historical Society, a volunteer group that Sperry has been a part of for many years, including as president more than once. MHS has kept the records of the town since before its incorporation in 1974, and when children visit during their initiation to local history they hear about the Miwok Indians, the Joaquin Moraga land grant, the time of the ranchers, to today's suburbia. Sam Sperry also plays a role during the historical evocation; he is the train expert, explaining to mesmerized children that Moraga once was part of the great Sacramento Northern Railway that linked Oakland to Sacramento. This contribution is just one of many for the retired municipal bond attorney. Sam Sperry has contributed on many occasions to the town's task forces, committees and commissions, providing his professional expertise for free. 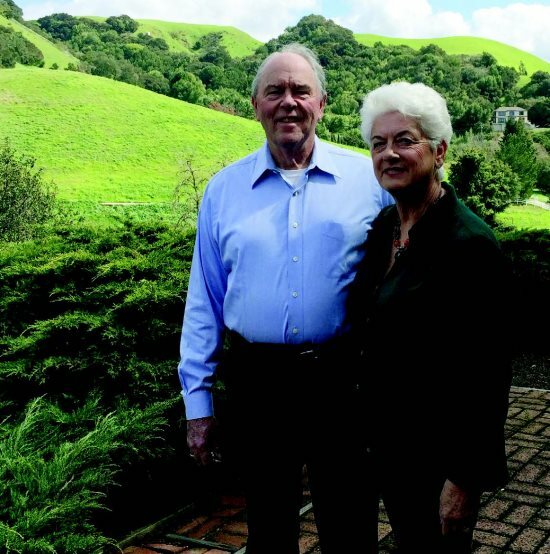 He was notably also one of the 15 original founding board members of the Moraga Education Foundation in 1985, as well as of the Moraga Community Foundation in 2015. He has been active, providing input and guidance to many volunteer efforts such as the Measure K for the roads campaign in 2012. Susan, who has been married to Sam for 27 years - it is a second marriage for the two of them - is also active politically in town and has been a long-standing member of Preserve Lamorinda Open Space, an advocacy group that was originally formed in 2001 to preserve hillsides, ridgelines and the semirural feel of the community. She currently serves on the Arts in Public Places Committee. Sam Sperry is an active member of the Moraga Valley Kiwanis and is a past president of that group. As a Kiwanian, he was part of numerous projects benefiting the town such as the restoration of the band shell in the Moraga Commons Park. It is this group that has been organizing the Moraga Citizen of the Year selection for years, with the Chamber of Commerce, Saint Mary's College and Lamorinda Weekly. Last but not least in the Sperry's long list of volunteer contributions to the town is their joint facilitation and note taking of the Moraga Liaison meeting, a monthly gathering of officials and service groups in town and beyond sharing current news and future activities. Sperry says that he thought that he and/or Susan would never be citizens of the year since they live outside of the town's border. 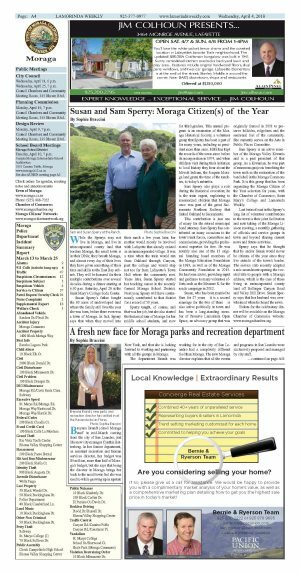 The service club recently adopted a rule amendment opening the coveted title to people with a Moraga address, which is the case of those living in unincorporated county land off Bollinger Canyon Road and Valley Hill Drive. Susan Sperry says that her husband was overwhelmed when he heard the news. Tickets for the celebratory dinner will be available on the Moraga Chamber of Commerce website: www.moragachamber.org.